Raid Synergy, Elemental DPS, Fire Totems and Personal Skill. It wasn’t long before I was asked to take my elemental shaman to the main raids more and more. Initially this was due to us struggling on the faction champions encounter in trial of the crusader. However, raid DPS showed an increase and I was happy to switch my main character anyway. Quite early in the history of the guild, a few people returned to their former guild and we started to recruit with raid synergy more in mind. We gained a mage fairly early but nearly all the applications we received were from melee DPS. It soon happened that the melee DPS were boasting some nice buffs and the casters just had me (with the shadow priest having returned to healing). Shortly after, our GM rerolled boomkin. One of our former members chastised myself and the GM quite frequently about our preoccupation with raid synergy and class balance. Now while I should stress we have always tried to consider applications from any class and spec, as we’ve progressed with Icecrown hardmodes, we’ve become more focussed on the synergy we take to a raid. Through the course of Icecrown Citadel, elemental shaman’s have received DPS buffs twice after concerns from the community that our damage output was lagging behind those of other casters, even considering the hybrid penalty. One thing I wish to stress here, there is a huge difference between a good elemental shaman and a poor one. While the rotation itself looks easy to “outsiders”, it actually takes quite a lot of focus. Chain lightning can be either an increase to DPS or a loss dependent upon the amount of haste you have. When taking into account haste cool downs (heroism, beserking, elemental mastery, hyperspeed acceleration and speed potions), this can mean you use or drop chain lightning from your rotation at various times during a boss encounter. Combine this with double hasting your flame shock’s whenever possible and the rotation can be challenging. Never the less, both times that Blizzard buffed our DPS, I agreed with it. This brings me onto how I believe elemental shaman’s are faring after the last round of buffs. Personally, while I felt the increase in game instantly, over time, I still didn’t believe it was quite enough to make us truly competitive with other good DPS. Last week however, we made another change to our roster and probably our last of Icecrown Citadel. Much to my delight, we took a demonology warlock. This was something myself and the GM had debated to great lengths in the past. Demonology, traditionally, lags behind affliction and destruction. As we had both played raiding warlocks for many years, this was something we knew first hand. Indeed back in Trial of the Crusader, we did experiment with our GM specing demonology for a few raids. The result? His loss in personal DPS wasn’t being made up for by the increase in raid DPS. Never the less, we decided to try it again. Our basis for this decision was quite simple. We knew it was another caster DPS we wanted. We run with two full time casters (myself as the elemental shaman and him as the boomkin) and one part time shadow priest (who plays holy on fights requiring three healers). The addition of demonic pact would give the casters and healers easily another 100 spell power over what we currently received from my totem of wrath. In addition, we would be freeing myself up to use fire dps totems. This reset is the first that we have run with this raid composition and we didn’t honestly know how it would work. Our raid DPS has, however, been the higher than ever. Our Blood Queen Lana’thel kill took 4 minutes and 47 seconds down from 5 minutes 18 seconds the week before. We secured our first Professor Putricide kill on heroic after just 5 attempts. A fight that had looked slightly tight for us on DPS the week before. From a personal point of view, while initially hasty about using fire DPS totems (and the range issues that come with this), I’ve been rocking the meters again. For reference, on both the above kills, I received the bite second. For anyone wondering, I was glyphing for the reduced cooldown on the fire elemental totem on bosses where the encounter lasted long enough to use it twice. For us, this is Lady Deathwhisper heroic and Lich King normal. Outside of that, I’m switching between glyph of lava and glyph of flametongue weapon depending upon the encounter and what I’m casting. If chain lightning is making up a good portion of my damage, I’m glyphing flametongue, otherwise I switch to lava. I’m then using a combination of the fire elemental totem and searing totem. As a shaman who has always dropped totem of wrath, while I was theoretically aware of the loss in personal DPS that was paid by buffing the raid, I hadn’t been quite so personally confronted with it before. Obviously, this is going to be a thing of the past come Cataclysm. Overall in our opinion the moonkin setup wins so there is no spot for an ele shaman in our raids. Ele shaman can do decent dps if ToW isn’t needed. But they lose too much dps when buffing with ToW because the fire dps totems aren’t available. If you absolutely want to min/max your raid then yeah, ele shamans are pretty bad. Do you absolutely need to min/max your raid? Is the ele shaman much better player than the rest? There might be a spot for him afterall. Its not always just about what the class/spec can do. 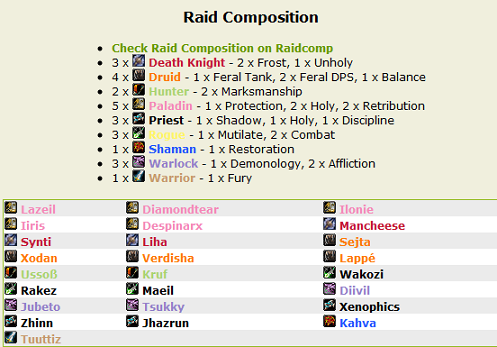 Its also about the player too to atleast some degree..
Paragon’s actual raid setup can be seen below. The image is courtesy of mmochampion. I’d like to emphasise, that I’m not the type of player to go screaming for buffs because a guild don’t use an elemental shaman (also for reference, they didn’t take a mage to that first kill either and I don’t think anyone can realistically argue that mages’ have had a bad expansion). As he stressed, the personal skill of the player is critical and you will find elemental shaman’s well represented amongst the rosters of the top guild’s in the world. However, notice again that he says when using totem of wrath, elemental DPS is sub-par in comparison with other equally skilled DPS. Obviously in the case of Paragon we’re referring to players at the absolute cutting edge of PvE raiding. Another thing to consider is that no one else defeated the Lich King on heroic with the same Icecrown Citadel buff that they did. All following kills have been achieved with the 10% increase to damage and healing. Obviously, Cataclysm will already address the issue with the loss of personal DPS that comes from buffing your raid. Quite simply, elemental shaman’s will gain a talent option allowing all our fire totems to provide the spell power buff. In addition, it will scale with our gear exactly as demonic pact. In summary? Not only will we stop losing DPS due to our flagship buff totem, but it will also be of the same calibre as the warlock’s spell power buff. Cataclysm also addresses another personal annoyance for me; AoE damage. When it comes to AoE damage, we have to wade into the melee, drop down a magma totem, perhaps throw a thunderstorm, wade back out, casting fire nova as we go and then beginning to chain lightning everything. When you compare this to a warlock, mage or boomkin, they stand still and channel. Cataclysm is bringing us earthquake. A new, likely channelled, persistent AoE talent. For reference, you can read my full review of the shaman changes for Cataclysm, here.